Most remakes are duds, so it makes sense that this one should be “Dead” in the water too. 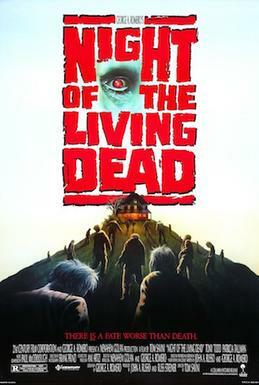 However, 1990’s Night of the Living Dead has taken on a life of its own independent of the inestimable original, and easily exists in the upper third of undead flicks. The genre is admittedly running on empty right now, and has been for a few years. To lay our biases out on the table, neither of us warmed to the frenetic, though ultimately unsatisfying Train to Busan. But give it a few years and the zombie genre’s corpse will be exhumed and someone will have another go, perhaps a return to Haitian roots a la The Serpent and the Rainbow, and one would hope, not another jokey My Fair Zombie-type feature. 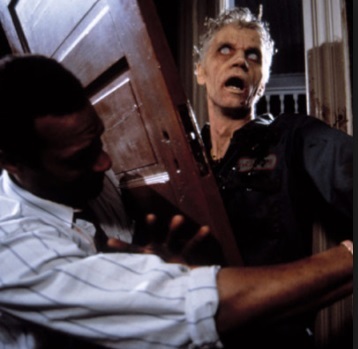 In this remake, effects man Tom Savini (with whom the authors of this site had a chance to chat — see our transcribed interview with Savini) is in the director’s chair. And what we end up with, is greater moral agency for Barbara and more badassery from Ben. The twosome connect in a Pennsylvania farmhouse when her family is under attack. They meet fellow survivors, and thus begins a lengthy test-of-wills over what to do next and how it should be done, with the Coopers (a snooty hubby and wife dressed for the opera) content to just hunker down in the cellar, with Ben seeking to stand his ground above, board up the windows, and take their chances with the remaining firepower. Things move along at a terrific pace, even if the deviations from the source material aren’t that pronounced. When Night of the Living Dead was released on Blu-ray, Umbrella apparently restored much of the color richness that had been lost. What’s odd though, given Savini’s Sultan of Splatter’s gore pedigree, is that this aspect of the film is given short shrift. In Savini’s hands, even a paint-by-numbers slash-and-stalk like The Prowler is given extra heft with its incredibly gory kills. In Night of the Living Dead the blood and guts are as subdued as the color. 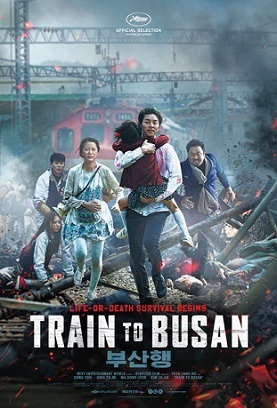 Train to Busan sounds like a bad prog rock album, something that was probably recorded live in 1977 and featuring a synthesizer the size of a small bachelor apartment. What it is though, is a South Korean horror film set on a train, which against all odds, actually manages to reproduce the tedium of rail travel. 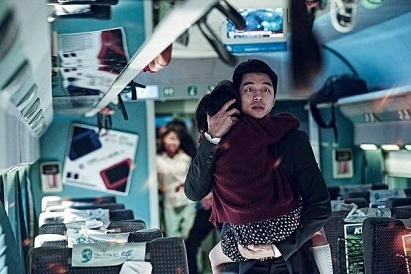 Wildly overpraised on all fronts, Train to Busan actually received commendation for what the New York Times called its “class warfare,” as if this is the first time in movie history where a guy with calloused hands took a slick city dweller to task, making him a better man in the process. Seok-woo is the latter. We know he’s unsympathetic, because like in Hollywood, people in certain occupations come with a set of tedious expectations: as a fund manager, ergo, he’s a leech on society. If this were a rom-com, he’d have a writer (the noblest creature on earth, second only to an inner-city kindergarten teacher) rescue him from a life of crass materialism. Suddenly, a convulsing young woman boards the train with strange striations on her leg, a makeshift tourniquet wrapped around her upper thigh. And it’s time for another stock character to sound the alarm, a vagrant warning that people are dying (the homeless are either dispensers of wisdom, or crazy, but seldom anything in between when it comes to the silver screen). Turns out Mr. No-Fixed-Address is correct! There’s an infection, and it’s spread farther than the afflicted girls’ gams, that is to say, throughout South Korea’s southern coast. News broadcasts start to report zombie outbreaks country-wide. Now it’s up to the passengers, which include the elderly, some evil corporate types, a baseball team, cheerleaders, etc, to save themselves from rampaging zombies. Much has been made of these zombies. They’re fast, they’re plentiful, they’re loud…but ultimately they’re tedious. Train to Busan, like a locomotive, works on one level, and one level alone. Never have so many sliding doors been slammed into the faces of the rampaging undead. It’s not gory enough either, and there’s a noticeable lack of spirit.